In documentul prezentat, Jurizarea Competitiilor de Karate bazata pe principii de Karate Traditional - "COMPETITION JUDGING BASED ON TRADITIONAL KARATE PRINCIPLES, de Hidetaka NISHIYAMA" publicat in 2002, am pastrat limba originala in care a fost publicat documentul pentru a transmite cat mai corect nuantele si intelesul acestuia. 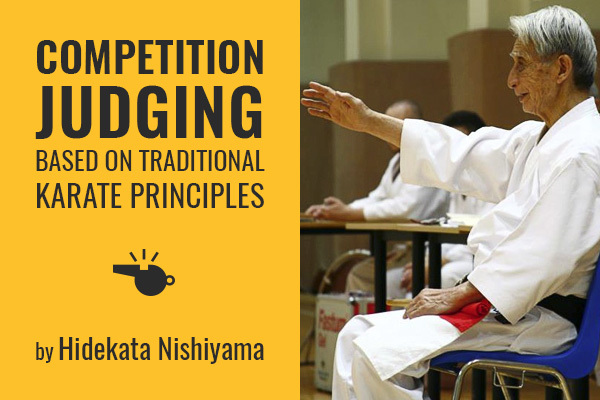 Maintain sense of two competitors simultaneously-Keep eyes in TOYAMA no MATSUKE state of awareness-in order to see actions of both competitors -as if participating with athletes. The judge also maintains breathing state ready at any moment for KIAI, thus keeping synchronized with competitors. When competitors initiate their movements, react with them with your own body thus staying in tune with them. The judge follows the action with both eye and breathing and thus prepared for KIAI just as athletes are prepared to KIAI. Pay close attention to competitors' feet as they make strong pressure to floor without "bouncing”. At the moment at detecting a competitor's initiation of techniques (maximum pressure to floor), the judge exhales and makes sound (like all “HAII”) at same time thrusting arm to begin indication of score or no score depending on outcome of the competitors technique. At same time, the judge takes a mental photograph of the competition action by which to make his final decision relative to scoring. Review this image as a means of judging and scoring. Proper reaction of floor pressure at final stage of technique is the only way to produce TODOME and true KIME power and thus, a scoring point. If no correct floor pressure, then KIME and TODOME is impossible to achieve. At this moment, while the arm is moving, decide if score or not, then continue with "yes" or "no" arm signal. Remark: After initial arm motion, make the judging decision in a split second if possible. If not, a little late is okay because proper review and accurate judging is most important. Degree of impression perceived of outward expression of inner body dynamics. Finalul documentului: COMPETITION JUDGING BASED ON TRADITIONAL KARATE PRINCIPLES by: Hidetaka NISHIYAMA / ITKF - 2002.